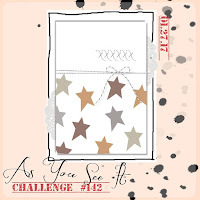 It's so good to have the As You See It challenge back up and running. If you joined us last week for our return, then thank you. If you're just joining us, then welcome! This week we have another sketch for you. This one turned into a challenge for me as at first I didn't even notice the tucked in elements at each side of the front panel on the sketch we were given! That caused a bit of a rethink! I've been playing around a lot with wedding and anniversary cards because I'd purchased the Falling in Love DSP and Falling for You stamp set from Stampin' Up plus I recently held a Saturday Special class with a wedding and romance theme. Although this card was not one of the ones I taught, I had all the things on my desk so I naturally played around with them some more - as you do! I don't know about you, but I find mixing designer papers a bit tricky probably because I so seldom use DSP in my cards. 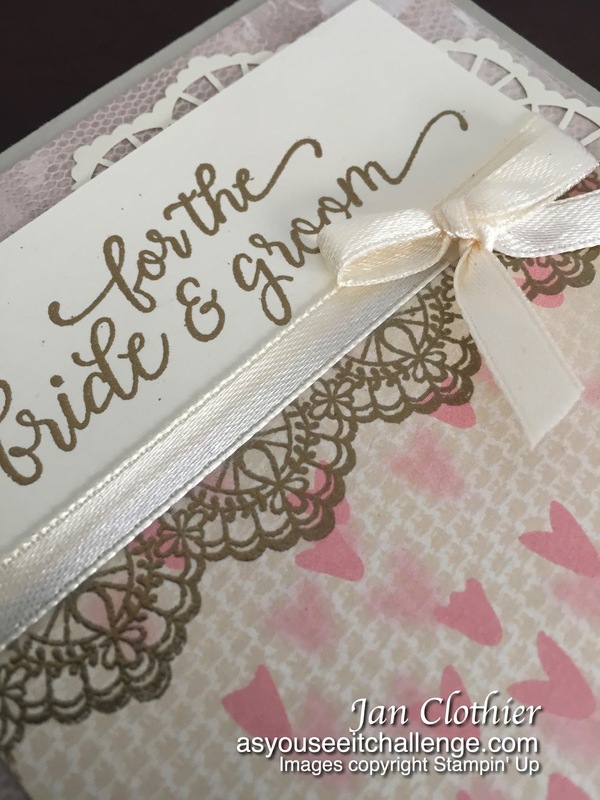 At least with Stampin' Up, you know things will work together. I'm really liking the lacy edge design from Delicate Details, which is my favourite Sale-a-bration item this year. You can earn the whole set for free with any order of $110. It's so pretty gold embossed but just as lovely in plain ink. You have until 11.55pm PST on Wednesday 8 February to join us in this challenge. We'd love to see what you do with it. 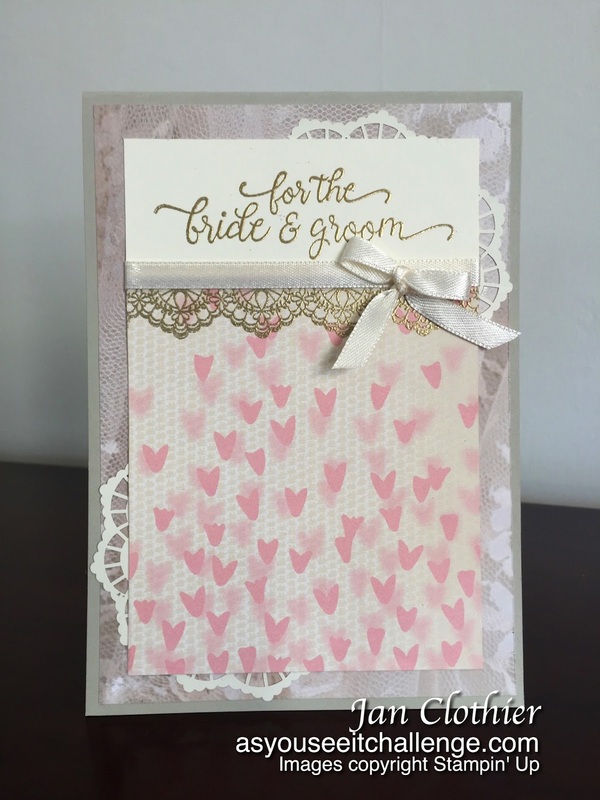 Gorgeous card Jan - I love the soft pink and the addition of the lace details stamp. Great dsp combo too - I'm always nervous about mixing them, but the subtle lace really works on the background here. Funny how we used the same suite of products, yet our cards look quite different - love that! So glad to see AYSI back on full form too! Thanks, Joanne. It's good to be back! I agree that it is wonderful that the same suite of products and same sketch can produce such diverse results. 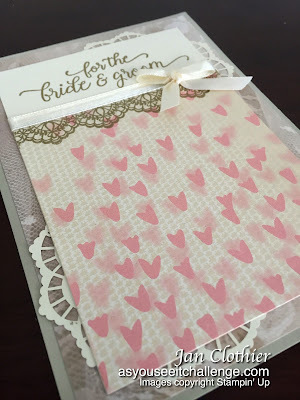 I did think when I saw your card that we easily could have made each other's card! Great to have you back in our gallery.